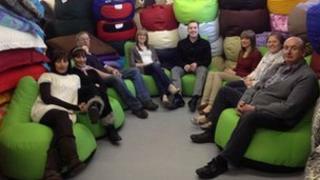 A small Lancashire business has won a contract to supply 8,000 bean bags for the London Olympics. R U Comfy, based in Blackburn, has begun producing the lime green bean bag chairs to be used by athletes and staff at the Olympic Village. The company, which has been going for 30 years, said it planned to double its team of 10 machinists to cope with the extra demand. The contract is worth a quarter of the firm's entire turnover from 2011. Geoff Ainsworth, managing director, said: "It's going to take 1,200 non-stop hours to manufacture the quantity needed to meet the mid-May deadline, then 25 lorry-loads to get them to London. "It's great really, it will keep us going for the next couple of years at least. "It is a lot, but we've already started production and taken on extra staff to make sure we get them done on time."